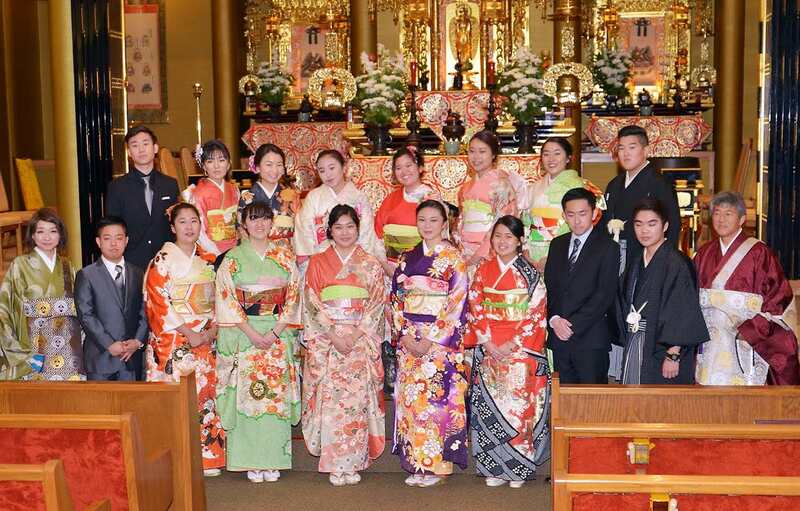 The beautiful colors and gorgeous patterns on the women’s kimonos; the dark, crisp lines of the men’s hakamas and western style suits – this was the wonderful sight at the Seijinshiki at the Gardena Buddhist Church on Jan. 13. Seijinshiki is a “coming of age” ceremony that mark one’s reaching age of maturity, reflecting both the expanded rights but also increased responsibilities expected of new adults. This holiday, “Coming of Age Day” (Seijin no Hi), is celebrated in Japan on the second Monday in January. It has been observed since olden times and started when a young prince donned new robes and a new hairstyle to mark his passage into adulthood. Rev. John Iwohara, head minister, officiated the ceremony in which the participants were presented with certificates and commemorative gifts from the church. Rev. Sala Sekiya, assistant minister, provided assistance during the ceremony. The participants and their families were treated to a traditional Japanese tea ceremony conducted by Kay Inose. The participants learned the proper performance of the ceremony and the history of the tea ceremony. A big “Omedetoo” to this year’s participants: Jonah Chang, Jaimee Hamasaki, Madison Hirano, Jeni Kawate, Brandon Kong-Song, Aya McGlothlin, Loretta Meza, Scott Mitani, Derek Morimoto, Sean Murakoshi, Teri Sakatani, Stacey Suzuki, Marley Uyemura, Lauren Wong, Kristine Yada, Lindsey Yoshiyama.